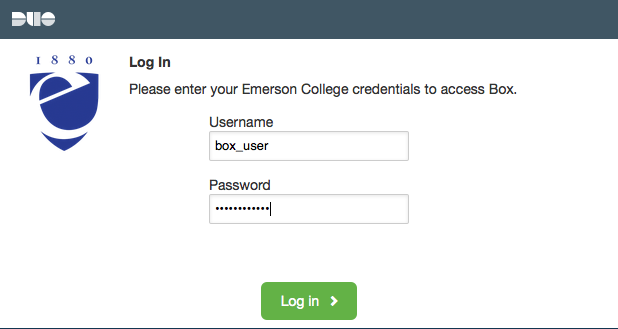 When you visit http://box.emerson.edu, you'll click Continue to log into Box as part of Emerson College. 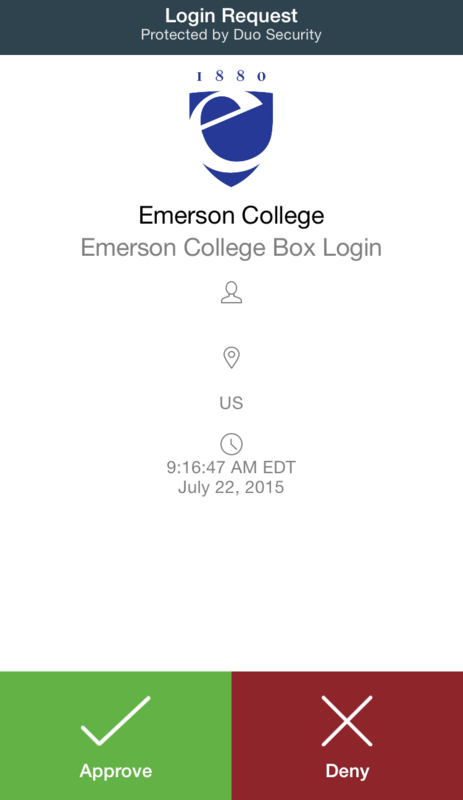 Log in with your Emerson username and password. 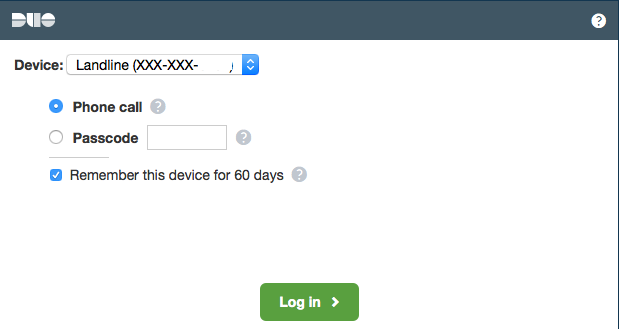 Box is protected with two-factor authentication, so if this is your first time logging into Box, you'll need to set that up first! 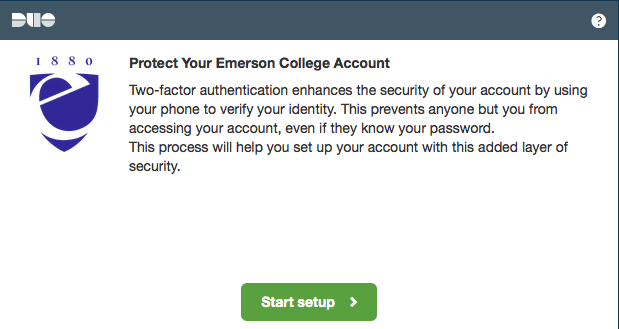 Emerson uses a service called Duo to provide two-factor authentication. The basic idea is that you need a second verification, in addition to your username and password, to authenticate your login. Duo makes this easy, and allows you to use several different methods as your second verification. Your smartphone—apps are available for iOS, Android, Windows Phone, and Blackberry, so you're covered. This is the fastest and easiest method, and our top recommendation! 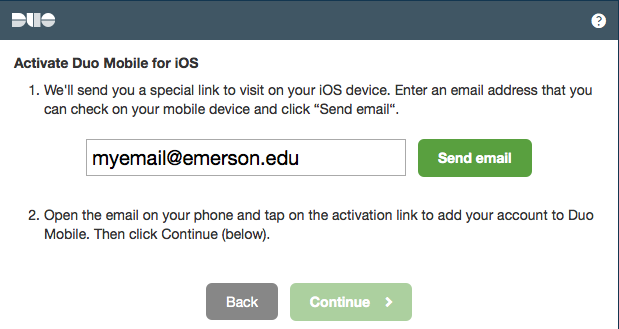 Login requests can be pushed to your phone for approval, or you can generate login codes if your phone is offline. SMS—you can receive a login code via text message. Voice call—you can even receive your login approval request with a voice call to either your cell phone or landline, like your desk phone. The simplest two-factor method, if you own a smart phone is "Mobile Phone," in which you install a free app and simply respond to a prompt when logging in. 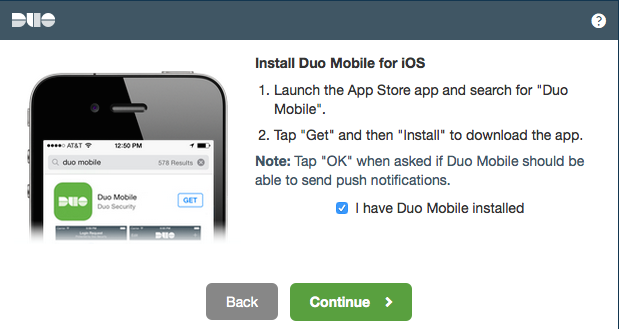 For the Duo Mobile app, simply install "Duo Mobile" from your app store. You'll need to allow notifications when you're prompted for permission. Choose the platform applicable to your phone. The instructions here are for iPhone. You've already installed Duo Mobile on your phone, so click Continue. Open the email you received on your mobile device (not from a computer) and touch the link provided. Now, your mobile device is available as an option. Select it from the list and select Mobile Push. Here, you can also enter a passcode generated by the Duo app. 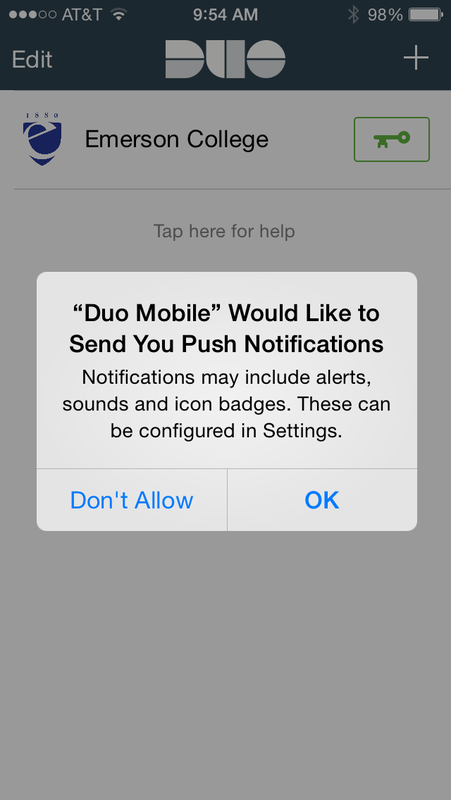 If you choose Mobile Push, the Duo Mobile app on your phone will alert you. Simply touch the green check mark and you'll be automatically logged into Box! You're in! We recommend this as the simplest way to get into Box when two-factor authentication is required. 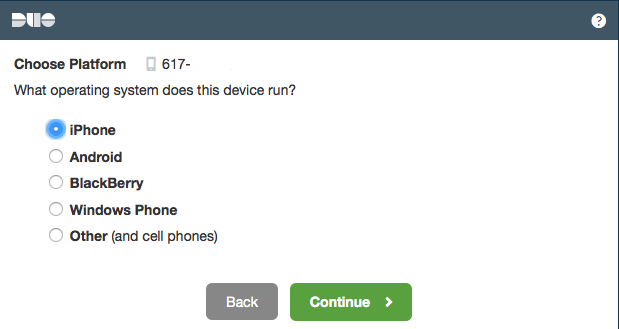 If you are not interested in using your personal device to log into Box, "Landline" is a great option. 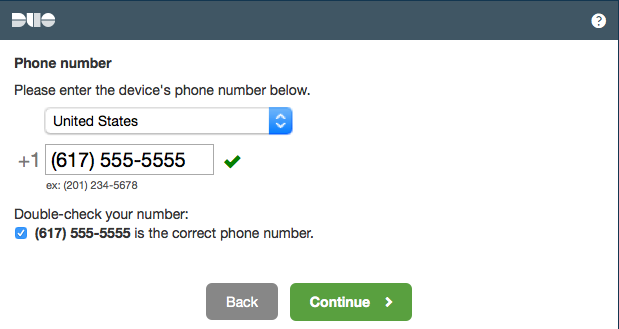 Enter your phone number and confirm it's the correct number, and click Continue. 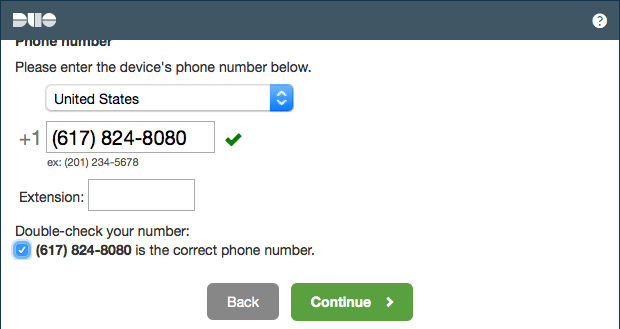 Now that your phone is enrolled, select Landline as your option for logging in. 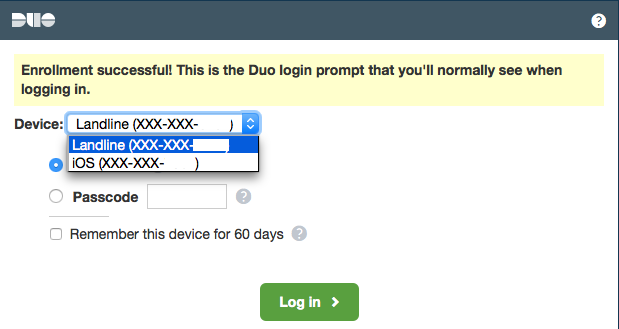 If you'd like for Duo to remember you for 60 days, check the box below - for 60 days, you'll only have to log in with your standard credentials, and not authorize with a phone. 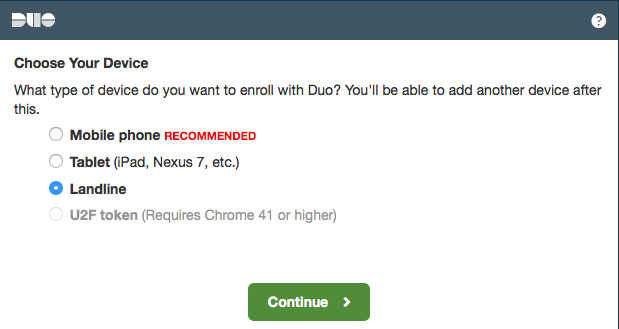 Note that if you clear your browser history and cache, Duo will no longer remember you, even if you chose this option. 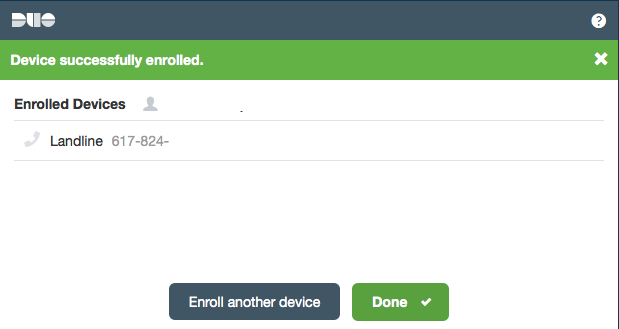 Also, if you choose this option, remember to have easy access to the phone you selected 60 days from when you enrolled. Your phone will ring—an automated voice will confirm that it's Duo calling, and ask you to press any key. Press any key, and watch Box automatically log in! You're in! This is your Box account - from here, you can create new files and folders and share them with colleagues. When new folders or files are shared with you, you'll see them here, so you'll know what you have access to.